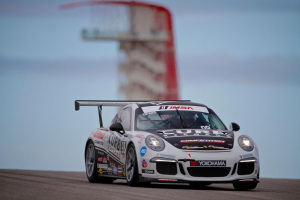 Austin, Texas – Competition Motorsports kicked off a big weekend at a big track in good form this weekend as Michael Lewis topped the field in qualifying for Race 1 of the IMSA Porsche GT3 Cup Challenge USA presented by Yokohama at Circuit of the Americas Thursday afternoon. Lewis turned his fastest lap of 2:13.546-seconds on his very first lap out with a flyer that was a second faster than the rest of the field. With a driver line-up boasting an impressive eight drivers, Competition Motorsports showcased its excellence in performance as Lewis finished second in the first practice and proceeded to top the second session while the rest of the Competition Motorsports drivers shaved at least 10 seconds off of their fast times from the first to the final practice session. For the first race on Friday, Calvert-Jones will start in Platinum Class competition from ninth position, after putting down a quick lap time of 2:15.406-seconds in his No. 12 Wheels Up Competition Motorsports Porsche 911. Calvert-Jones will keep himself extra busy this weekend pulling double duty as he will hop in a Mustang to race with Racers Edge in the IMSA Continental Tire SportsCar Challenge in between the two GT3 races on Friday. In the Gold Class, Fred Poordad led the qualifying effort and will take the green flag for Race 1 from sixth position on the grid in the No. 02 Affinity Motorsports/TLI /Competition Motorsports Porsche 911. Michael Zuieback will start the first race from ninth position in the No. 2 Discount Tire / Competition Motorsports Porsche 911. Blair Chang will begin the race from 11th place in the No. 09 The Agency/Competition Motorsports Porsche 911 while Competition Motorsports newcomer Alessandro Chiocchetti filed in just behind in 13th in the No. 49 Competition Motorsports Porsche 911. Mike McAlister drove his No. 32 Competition Motorsports Porsche 911 to a 16th place starting position with another new Competition Motorsports teammate Chris Pederson just behind in 17th in his No. 5 Discount Tire / Competition Motorsports Porsche 911. The first of the two 45-minute sprint races is set to go green on Friday morning at 8:00 AM (CT) with the second to follow Friday evening at 7:25 PM (CT). This entry was posted in News on September 19, 2014 by admin.